This estimate is definitely an outlier. Consensus among top economists is that growth will come in around 3.2% (blue line above). And the New York Fed’s own model is predicting a 3.3% print. If the Atlanta Fed’s 4.8% number holds however, it would be the best real quarterly growth since 2014. Great news, right? Only time will tell… The type of model used in their forecast is typically very sensitive to their inputs, especially early in the period being modeled. As more data comes in, the models’ predictive power gets stronger, as the below chart shows. We’re about 53 days from the Q2 advance release, which would put the error at about +/- 0.8%. When the Atlanta Fed estimate comes in high (or low) its been because the first few inputs available are on the positive side, so we’d argue for not putting a lot of confidence in the figure at that stage. This latest release is a bit different however. 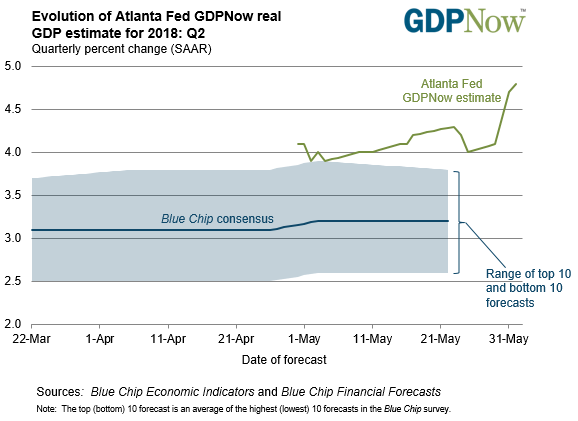 It is the 17th update for Q2… Granted things can change on a dime with these models and actual growth could be dramatically different than 4.8%, but its worth noting that after an initially high 4.1% forecast, subsequent estimates have been adjusted higher not lower. Its also worth pointing out the Atlanta Fed’s track record. 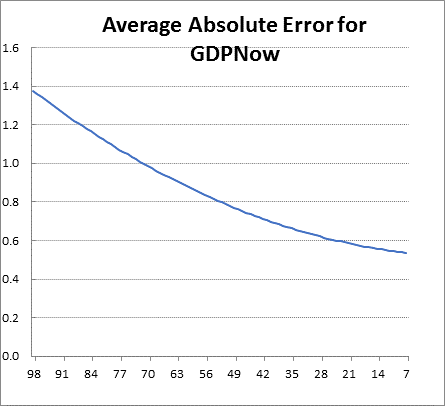 The average absolute error since they began the model in 2011 is +/- 0.6%. 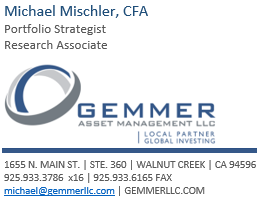 If the 4.8% figure misses to the high side, it would still put the estimate almost 100 basis points above consensus (assuming the average error).